We are manufacturer of Tissue Culture Rack. These racks are very useful in various type of tissue culture plants other tissue culture work in tissue culture room. Our Tissue racks are made of aluminum. Tissue culture rack is very useful for various types of tissue culture plants and other tissue culture work in tissue culture room. Made By: Tissue rack are made of tubular mild steel pipes With Epoxy Powder Coated. Lighting : Four fluorescent tubes are glare free lights are built in upper portion in worktable. UV Germicidal Light: Are fitted inside the rack. Control Panels : All control panels are fitted tops of tissue culture racks. On/Off switch of fluorescent tubes and UV tubes. All control panels are fitted separately in each rack with indicator light. 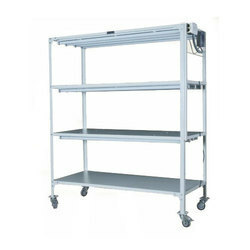 Easy Mobility : The whole rack is provided with four nos. , castor wheels at the bottom for easy mobility to any place.